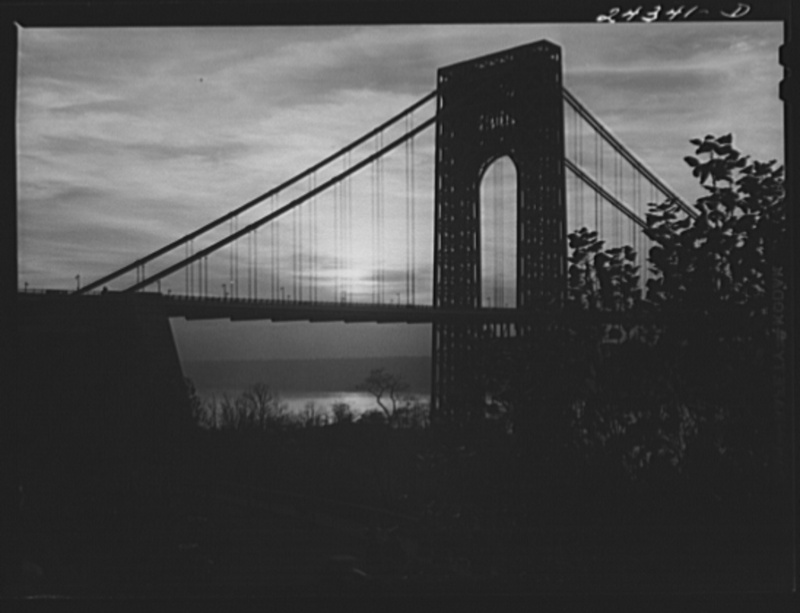 Happy 81st Birthday, George Washington Bridge! The French architect Le Corbusier reportedly said you are “the most beautiful bridge in the world” – you “gleam in the sky like a reversed arch.” But are you really a work of art? "George Washington Bridge. New York City." By Arthur Rothstein, 1941. From the Farm Security Administration - Office of War Information Photograph Collection at The Library of Congress. 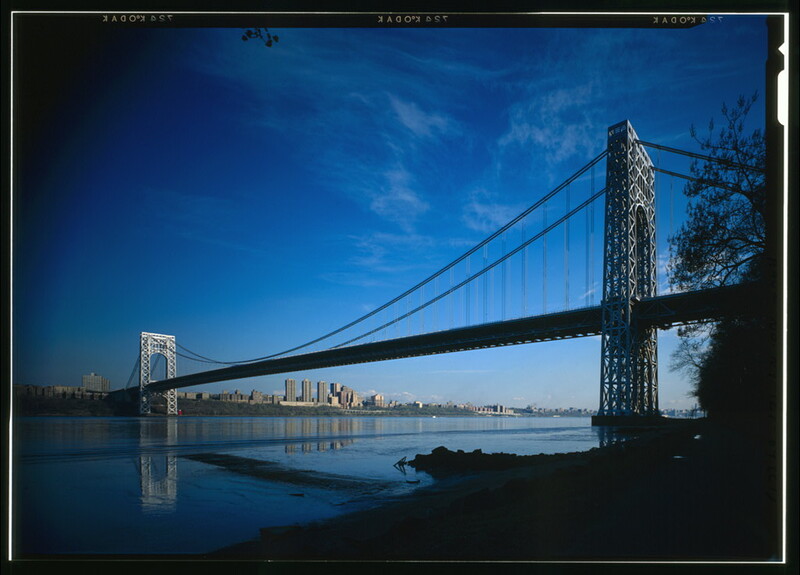 Apart from its obvious elegance, I think that the George Washington Bridge (GWB) is notable perhaps for four reasons. First, at 3,500 feet it was nearly twice the span of the longest bridge at the time — the Ambassador Bridge at 1,850 feet. Second, Ammann was able to make huge cost savings by reducing the estimates of live load (i.e. due to traffic and trucks etc.) and relying on a relatively new so called ‘deflection theory’ to design the bridge. Third, the bridge was built during the Great Depression, but there wasn’t enough money — a cause of a change in appearance because the now famous steel towers were due to be faced in concrete and stone. Fourth, Ammann designed the bridge so that it could be added to, though that didn’t come about until 1962. With its 14 lanes of traffic it is now one of the busiest bridges in the world. Given later events such as the collapse of the Tacoma Narrows Bridge — the famous ‘galloping Gertie’ which Ammann actually investigated — one could argue that Ammann’s design was ‘brave’. Large changes from what has gone before, as at Tacoma, can be challenging. It is interesting therefore that as a young man Ammann made his name early by writing a report on another famous bridge disaster — the Quebec Bridge that collapsed during construction in 1907. At the time the Quebec Bridge was also to be a very large span at 1800 feet, rivalled only by the Forth Railway Bridge in Scotland with main spans of 1710 feet and built in 1890. Ammann would have seen and learned how the many errors in the design and execution led to the downfall of Quebec. He would have contrasted that experience so strongly with the way Sir Benjamin Baker and Sir John Fowler took meticulous care with the Forth after they had witnessed the collapse of the Tay Bridge in Scotland in 1879. I suspect that he learned much from those experiences. Suspension bridges are complex because the flow of forces in the structure is not easily calculated; engineers call them statically indeterminate. Only now with large computers can we model their behaviour with any confidence. Ammann was taught in Zurich at ETH by Wilhelm Ritter, the engineer who laid the basis for the new, but still rather approximate, deflection theory in 1877. Indeed Ritter taught arguably two of the greatest bridge designers of the early 20th century, Ammann and Robert Maillart, who was responsible for some beautifully elegant early reinforced concrete bridges in Switzerland including the world famous Salginatobel Bridge near Schiers. Ritter’s influence on two of his most accomplished pupils is clear in their work. 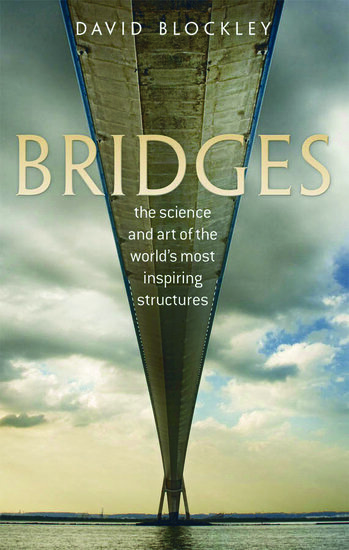 Ritter emphasised the importance of visualising the flow of forces in the bridge and its relationship with aesthetics. Josef Melan improved the new deflection theory in 1888 and Leon Moisseiff used it to design the Manhattan Suspension Bridge in 1908. The theory was so-named because it took account of the deflections of the structure under live loads (i.e. the moving traffic, etc.). Moisseiff was confident that the theory was accurate but he later was to design Tacoma Narrows. Perhaps Ammann was more aware of its limitations than some commentators, such as Henry Petroski, have intimated. He knew that the theory was based on quite severe simplifying assumptions. Darl Rastofer has written that Ammann was a reserved, self-effacing, and meticulous man, but one with a quiet inner confidence that meant he could hold his own. He was as comfortable at dealing with detail as well as taking an overview. Like others before him such as Thomas Telford at Menai Bridge in North Wales, Baker and Fowler at Forth, Ammann used theory. But unlike Theodore Cooper at Quebec and Sir Thomas Bouch at Tay, perhaps he was very careful to check and control the detail. I suspect that he was diligent in making sure he understood the flow of forces even if he knew he couldn’t calculate them precisely. I suspect that is why he went on to be so successful in leaving his mark on New York City with five major bridges that bear so much of the traffic flow to and from the city, and with his help on the high profile Golden Gate in San Francisco. General view of North Side of Bridge from NJ Side of River. From the Library of Congress Prints and Photographs Division. So is the GWB a work of art? Art is difficult to define but we can say it is a power of the practical intellect, the ability to make something of more than ordinary significance. Is the GWB an extraordinary bridge? Did Ammann achieve aesthetic sensitivity? He certainly achieved practicality; no-one can fail to be impressed. Le Corbusier liked it, so that is good enough for most of us. But of course Le Corbusier was a modernist, so he liked functionality; for example he saw buildings ‘as machines for living in’. All in all I think it is no accident that suspension bridges are some of the most beautiful structures we see around us. The graceful curves of the cables are the defining feature and they are entirely natural structures. They are the best examples of harmonious form and function. The GWB is one of the best as was Othmar Ammann.